Thursday, October 3, 1912: I really did go after all my doubtings, but now I feel just as tired as there is any use in being. Saw a flying machine whirling aloft in the air for at least 10 minutes. I think twas quite a sight to see. Grandma went to the fair in the nearby town of Milton. She wrote the previous day that she planned to go. Whew—I can hardly believe it, but I found a picture of the flying machine Grandma saw. George Venios, in his book titled Chronicles and Legends of Milton, writes about the Milton Fair. 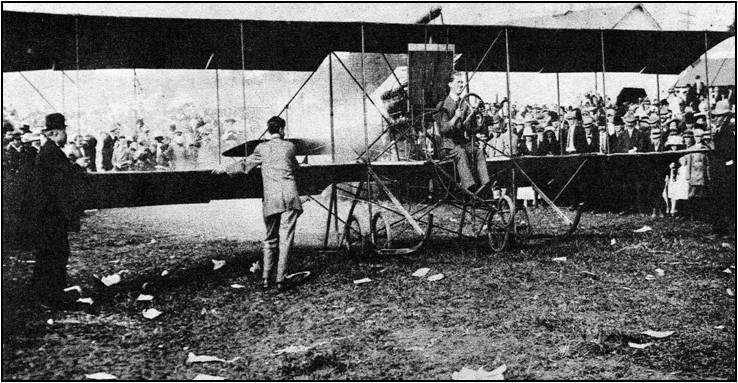 And, he includes a picture of the plane that was at the 1912 fair. The photo, taken in 1912, is a pusher type biplane and is believed to be one of the first aircraft to land here while on a hair-raising “barnstorming” tour. I contacted George and he generously gave me permission to include the photo in this post, so that you could see it. Thank you! When I found the photo, I got my magnifying glass out to see if I could find Grandma in the crowd; though, of course, I couldn’t. 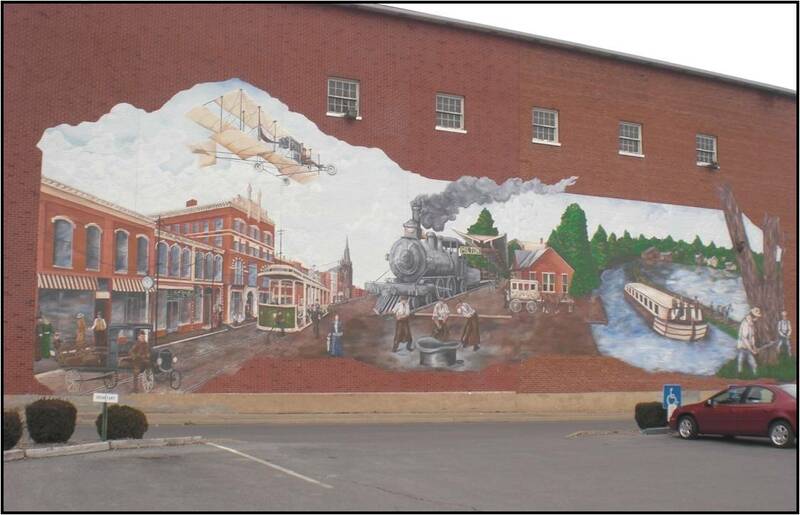 George also sent me a picture of a mural in Milton that reflects the history of transportation in the town. The mural includes an image of the 1912 biplane. Chronicles and Legends of Milton is an awesome resource that tells the story of Milton, and is full of wonderful photos. Milton has a really interesting history—and I’d encourage anyone interested in its story to get a copy of the book. Posted on October 3, 2012 October 3, 2012 by SherylPosted in MiltonTagged 100 years ago, 1912, diary, family history, genealogy. Next Next post: What Does “Didn’t Cut Much Ice with Me” Mean? This is really cool. Your grandma saw something that was chronicled by historians. You get to hear about it in her own words and also see a picture of what she saw. Can you imagine what her life was like. It went from seeing the first airplanes to the moon landing. From the horses to cars. Long dresses to pants suits. From wood stoves to electricty and all the small appliences. Just thinking about all that transpired in her life time. Amazing stuff. Such things we take for granted these days! What a thrill, both for for Helena to witness an airplane, and for you to do some detective work and add it to the narrative. I can’t help but think she is smiling! Very interesting. It must have been exciting to see a flying machine. A flying machine – what an amazing sight it must have seemed to be for your grandmother! And how lucky to find a picture actually taken on that day! It’s nice to ponder over how dramatically things have changed in just a hundred years. Way to go Grandma. Must be I got my bug from both sides of the family tree, I always thought just one side had a plane fascination . How wonderful to have found a photo and article about the plane that your grandma saw!